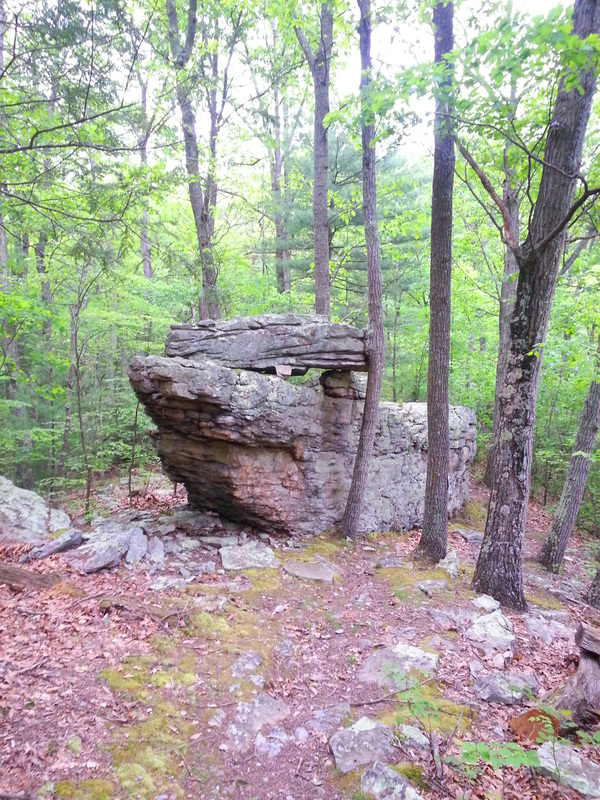 The original plan was to ride to the Ozark National Forest to meet my friend Rob. He was setting off on a ride from Birmingham, Alabama to the Yellowstone National Park, so I decided to join him for a segment within the Ozarks. My ride began on Thursday afternoon - catching up with a rainstorm near Radford, VA. After a few hours of the wet ride, I was finally in Townsend, Tennessee to stay the night with friends. 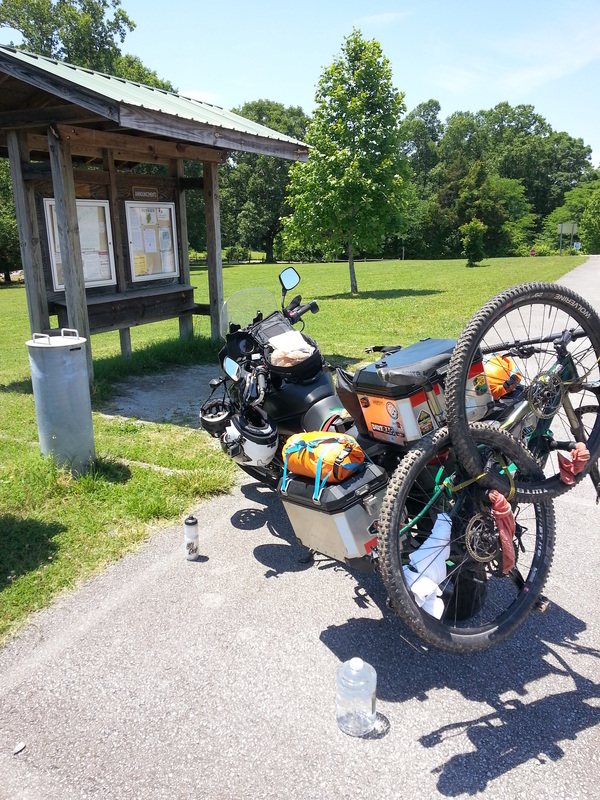 The next day I rode for about four hours to Montgomery Bell State Park near Nashville. 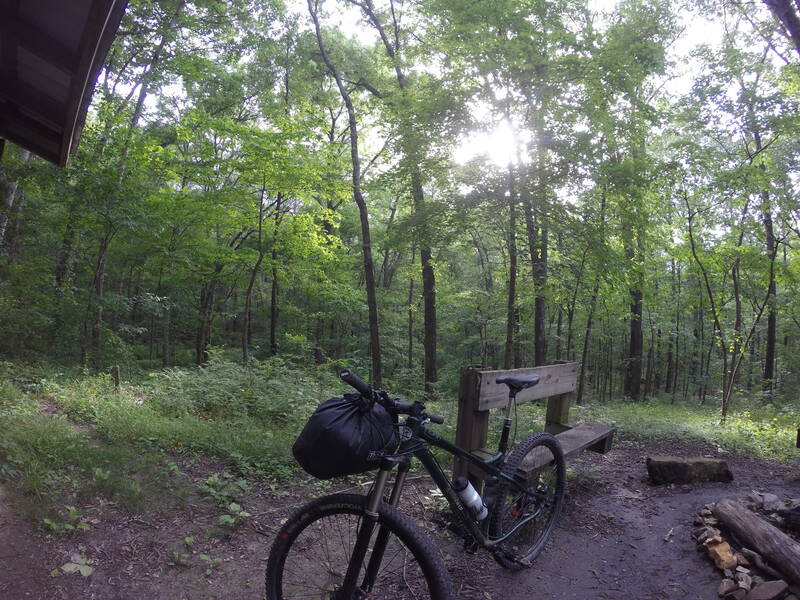 I unloaded my gear and headed to the trails. 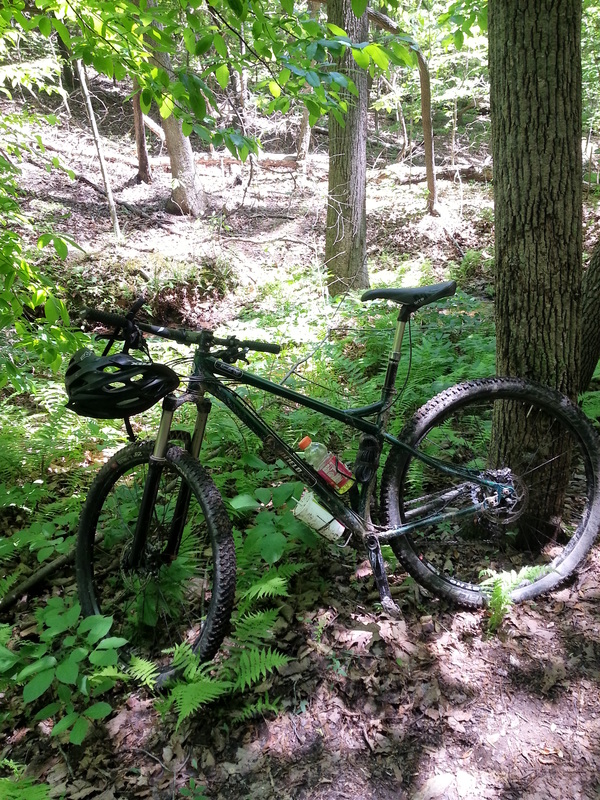 Although there were frequent trail markers, I found myself riding in circles and eventually decided to backtrack before becoming totally lost in the woods. Once I was packed up again, I scouted out my lodging for the night - a backcountry shelter along one of the park's hiking trails. As I sat by the shelter, picturing the next day's 8-hour ride, I decided I'd rather not continue any further. I was burnt out on the highway and certainly not looking forward to the return trip of roughly 20 hours on the asphalt. With that in mind, I chose to hike back to the bike, pack my things, and begin the drive east, going as far as I could before finding a roadside motel to crash for the night. Although I'm slightly disappointed that I canned the trip to the Ozarks, it's quite a relief knowing that I didn't have to endure another second on the long, boring highway. Rob understood too, as he's giving himself much more time to complete his ride, allowing for some rural routes and a more enjoyable pace. I think I'll revisit this trip in the future - only if I'm able to allot more time to its completion. 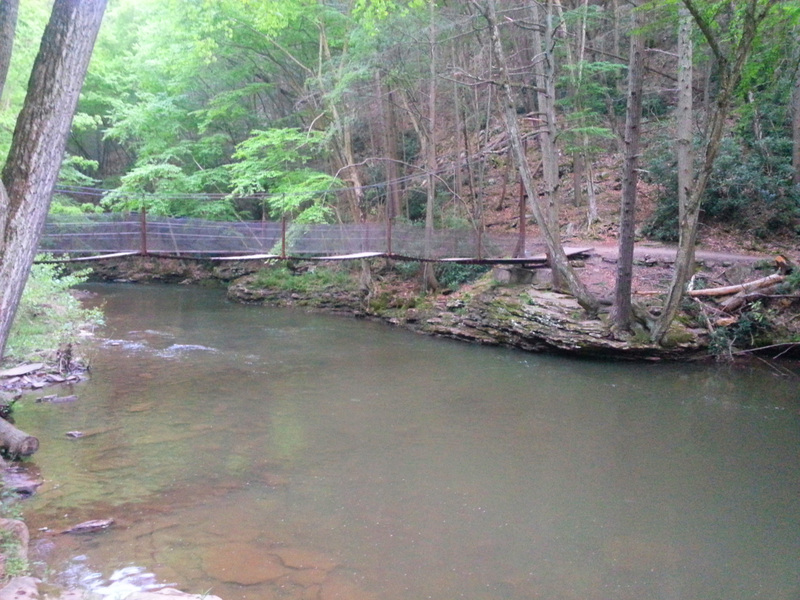 On the way home I decided to visit another new trail system since I had the mountain bike with me. 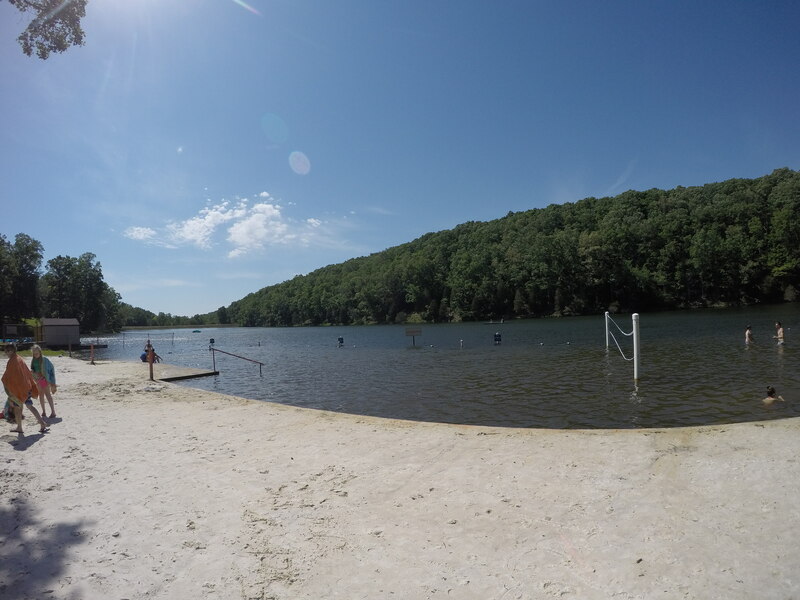 I jumped onto MTBProject and found the Crystal Springs Recreation Area in Wytheville, VA. 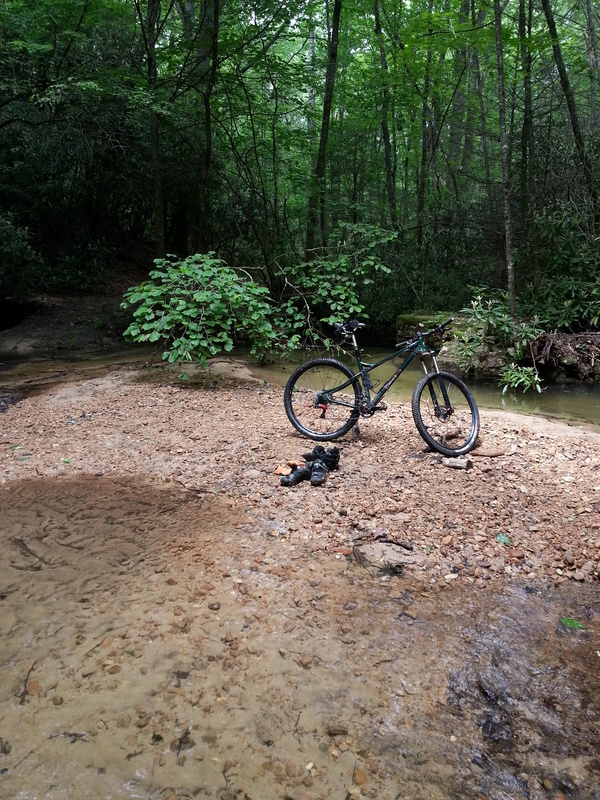 The trails were decent and the springs were an excellent reward after the ride [both on the mountain bike and the motorcycle]. 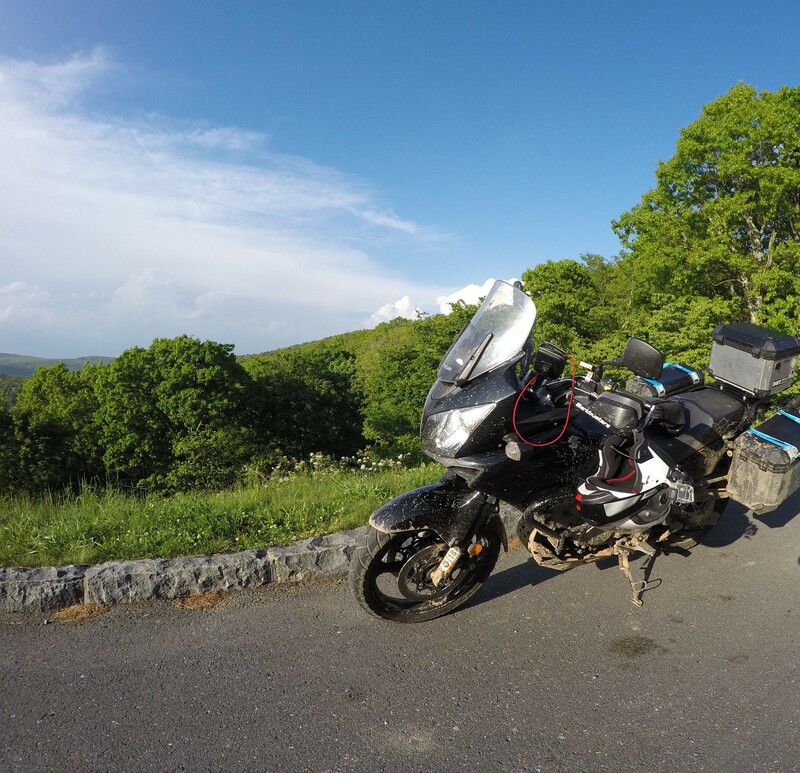 Rebecca and I tried to rendezvous along the Blue Ridge Parkway to camp that night along my ride home, but the lack of cell reception and some misdirection resulted in a delayed meeting around 8pm. She hadn't had anything to eat since breakfast and we'd still need to take several trips up a Jeep trail to the campsite I'd chosen to relay our gear, so we decided to can that as well. She took off east towards Richmond while I made one more run into the woods to retrieve the gear I'd stashed at our campsite. Eventually I was packed again and rolling home. 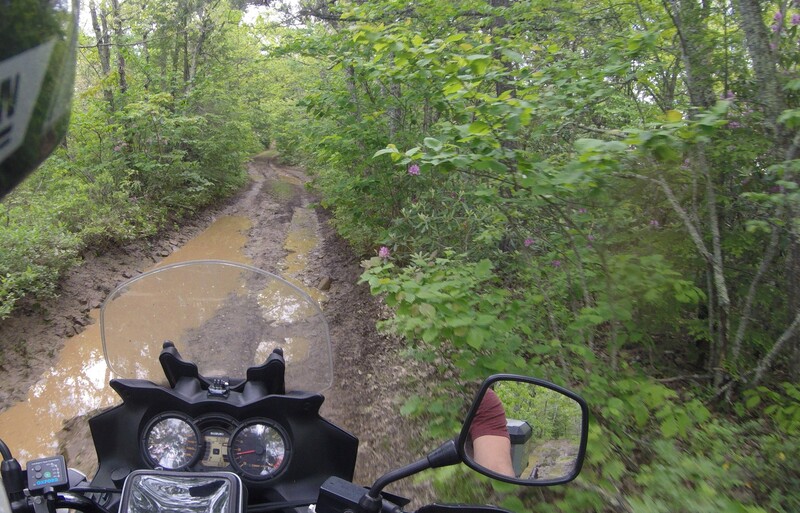 I can hardly remember a time I'd wanted to be OFF the bike more. 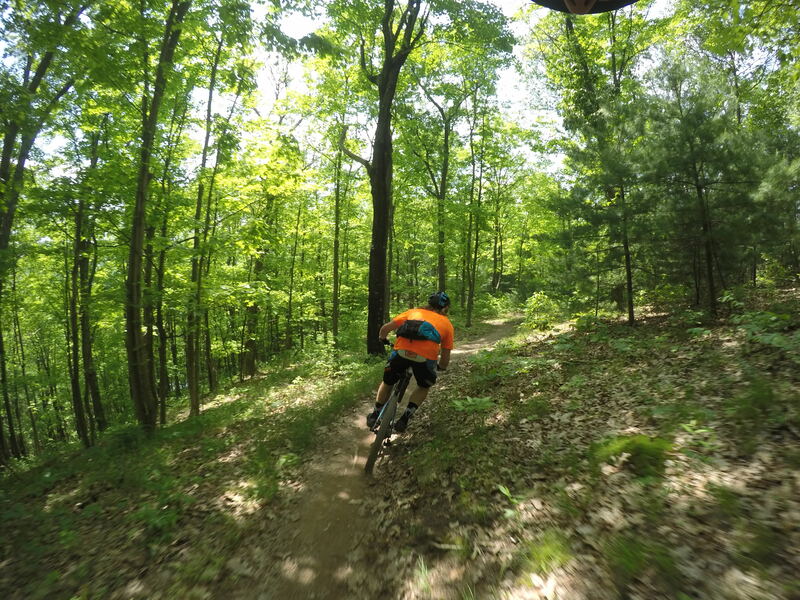 After last year's event was rained out, I was eager to get back to Raystown Lake in order to receive my fair share of time on their trails. I was delighted to find agreeable conditions all three days of my time there. 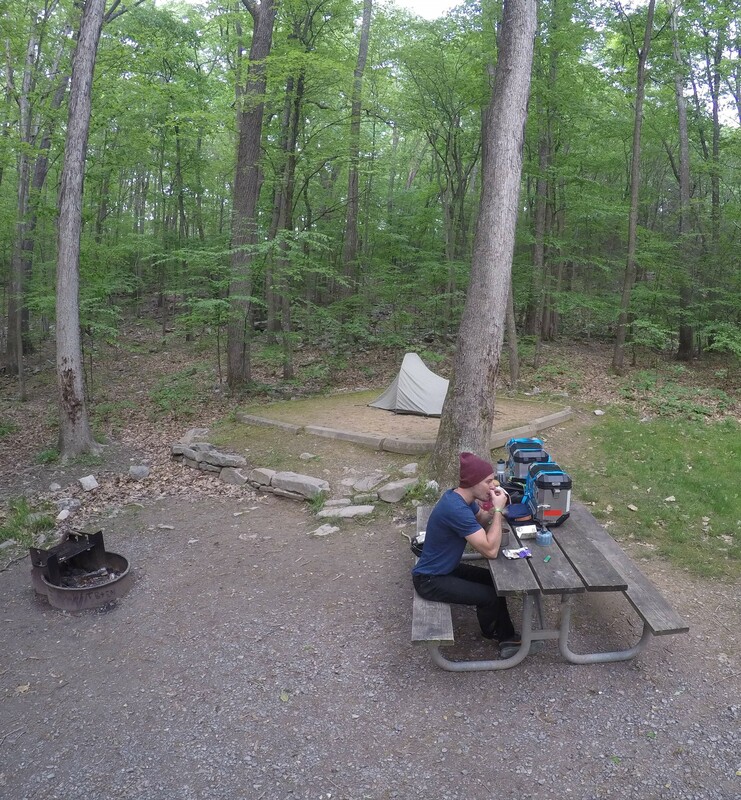 Camping accommodations fill quickly at the Susquehannock sites, but I was lucky to find the nearby Trough Creek State Park only about 45 minutes away from the venue. 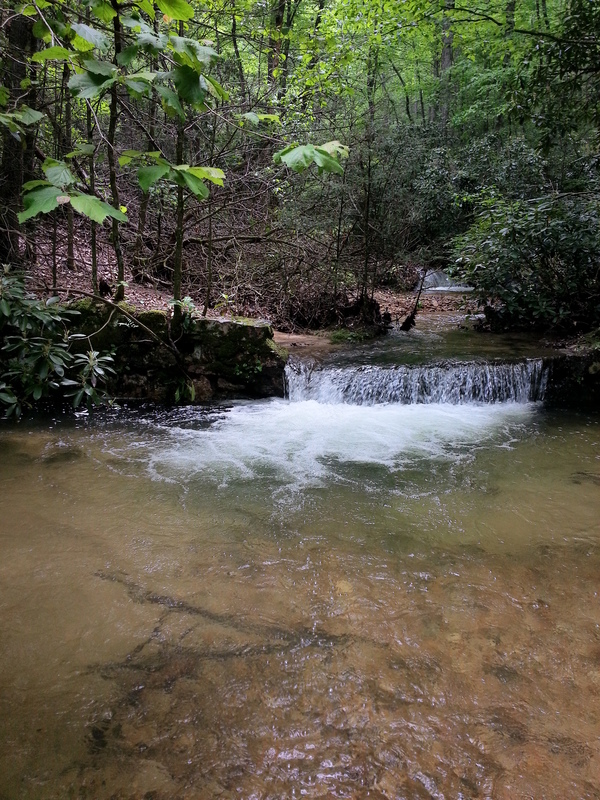 It was actually one of the highlights of the trip, with hiking trails and the beautiful creek to explore. This year I rode three consecutive days - testing the trails on A Giant Trance, Yeti SB5, Transition Throttle, Evil Wreckoning, and Pivot Firebird. I'm quite happy with my Canfield Nimble9, so I wasn't riding with the intent of buying. Still, it was fun testing my hand at new suspension designs and the 1x12 gearing that most new rides have adopted. Although I didn't stay within the same "range" of models, the clear favorite was the Evil Wreckoning. What I like most about my Nimble9 is that it hides the fact that it rolls on 29" wheels, still providing a quick, snappy feel in the corners. This attribute seemed present in The Wreckoning also - and it did so with 160mm of travel front and rear. 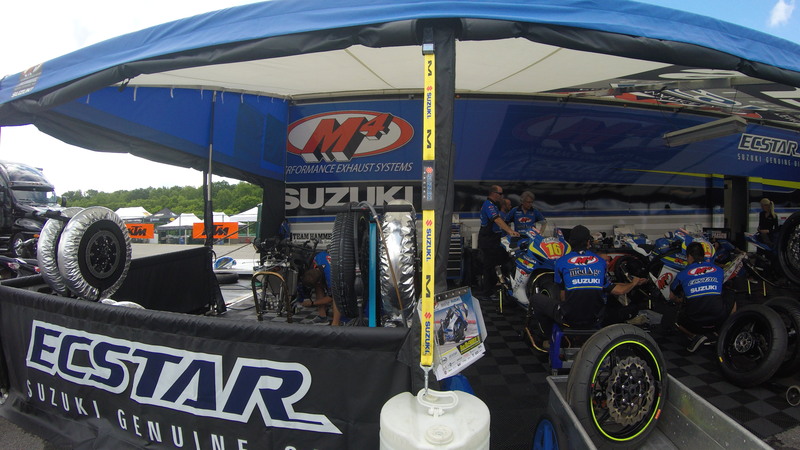 The last time I went to VIR was one of the first trips with the bus. 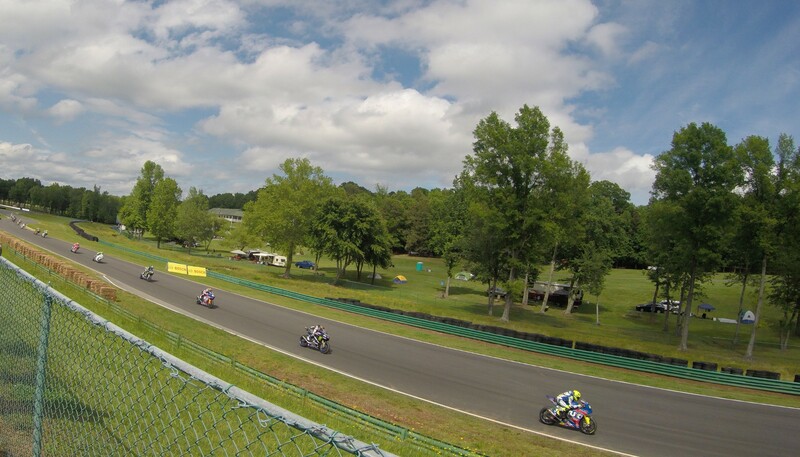 In a sort of commemoration of that trip, Scott, his son Alec, and I decided to make the trip to Alton, VA for the MotoAmerica race. 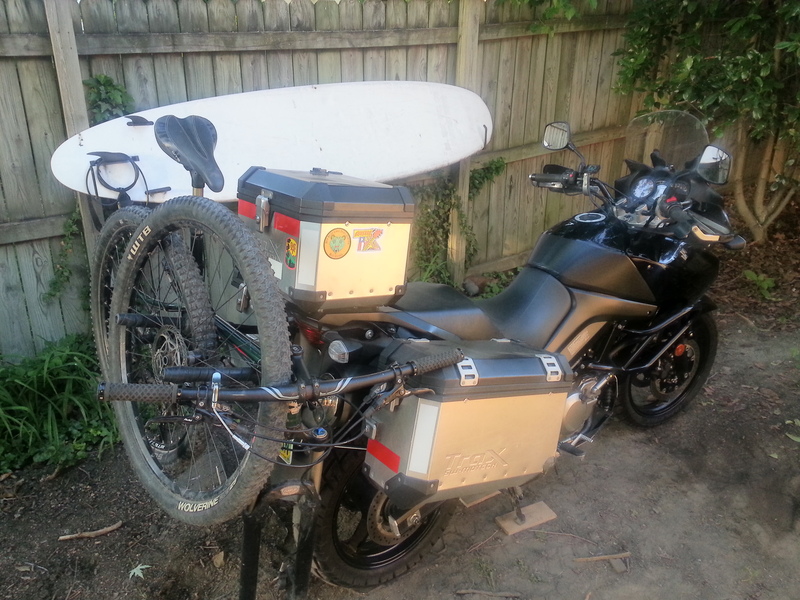 Scott and Alec rode from Roanoke, while I drove my Vstrom from Richmond. I arrived just as the national anthem played to begin the day's races. 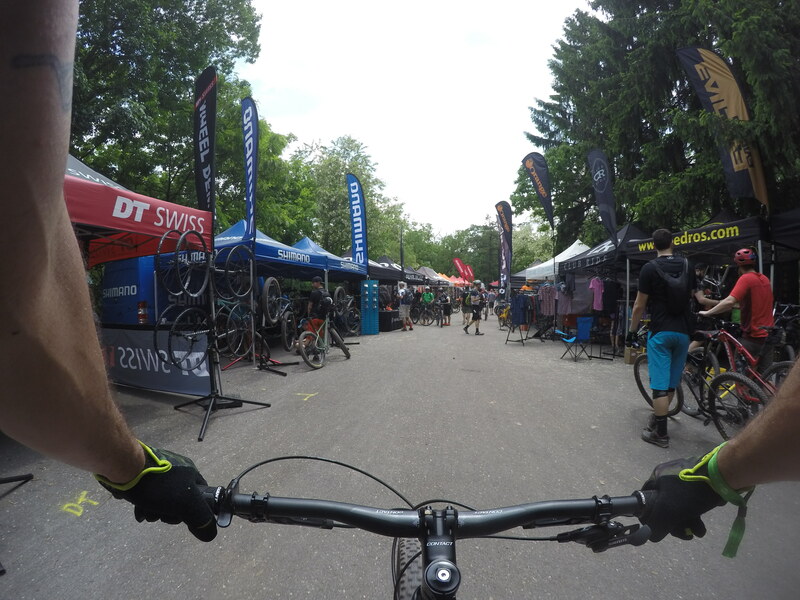 I unloaded my mountain bike from the new rack and began pedaling the perimeter of the spectator area as the 600cc class raced around the course. 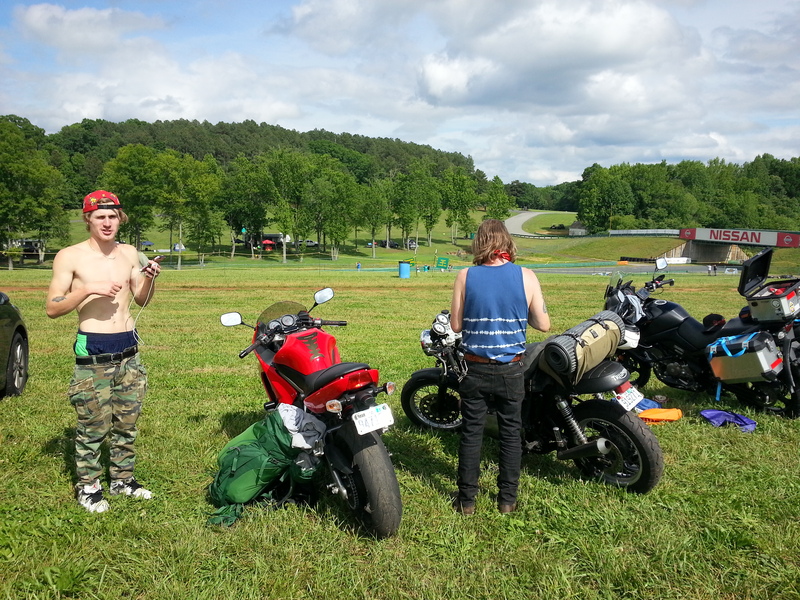 Near the halfway point of the 1000cc class, Scott and Alec arrived. 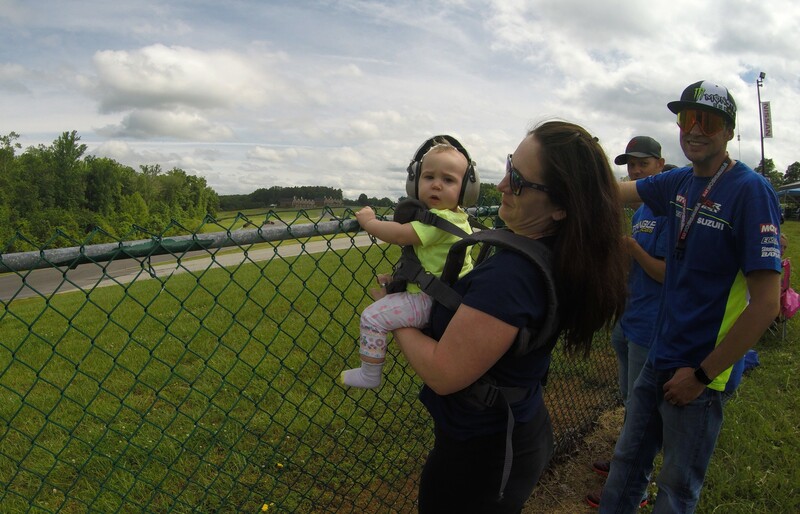 We watched that class finish their race and then made our way around the facility, exploring the pits and enjoying the sunny day that emerged from a gloomy forecast. After the award ceremony, the place emptied out except for overnight campers. We rode into Milton, NC for dinner at Milton Tap & Dye, returning to a ghost town of sorts. We kept the good times rolling, though, kicking back a few cold ones and catching up on lost time. At one point a torrential rain fell from the sky, so we sprinted to my two-man tent and crammed in to wait it out. After that surprise, Scott and Alec decided to sleep under one of the event shelters instead of their original plan of sleeping under the stars. In the morning, they woke me with the revving of their engines just outside the tent. I emerged and began packing up the bike to head out. Once on the road, we parted ways near Danville as I took 29N to Lynchburg. 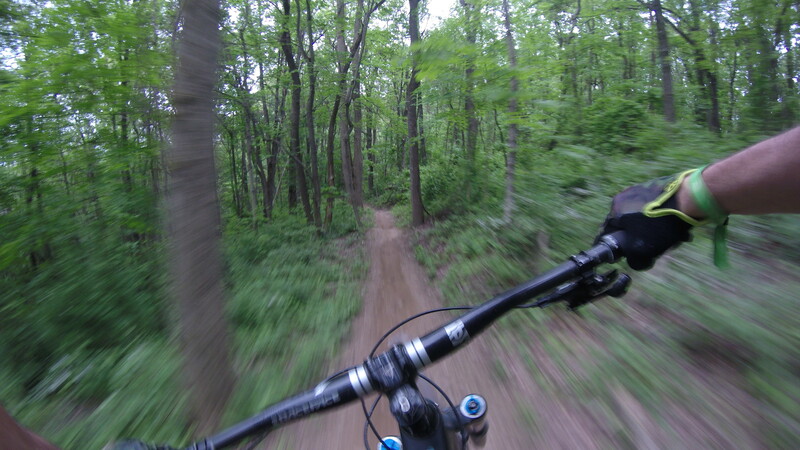 The main attraction in Lynchburg was the series of mountain bike trails on the campus of Liberty University. 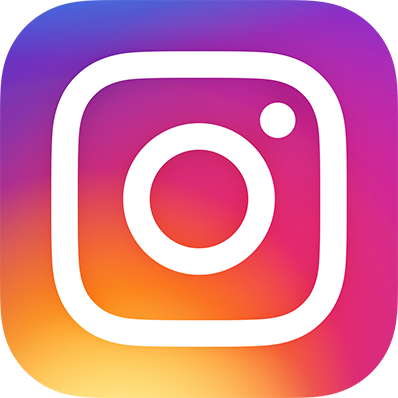 Although I only scratched the surface, I was fairly impressed with the trails - especially one called Playground which offered wooden features, tabletops, and berms. 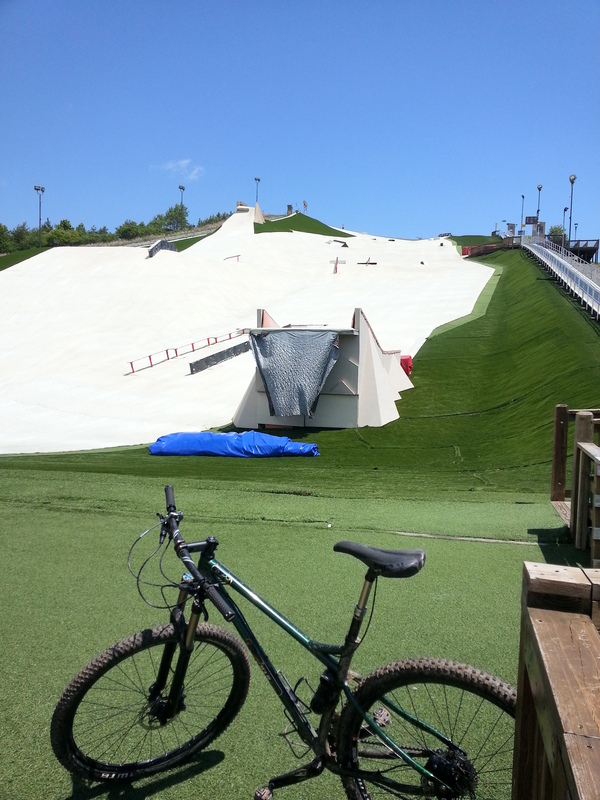 They organized their trails on the south face of the ridge which houses the Liberty SnowFlex Center. Once you've reached the bottom, the climb back up is relatively arduous, so I only made one loop before continuing east to Richmond. Last year I rode my motorcycle to the Dirt Rag Dirt Fest since I was able to demo a bicycle at the event. 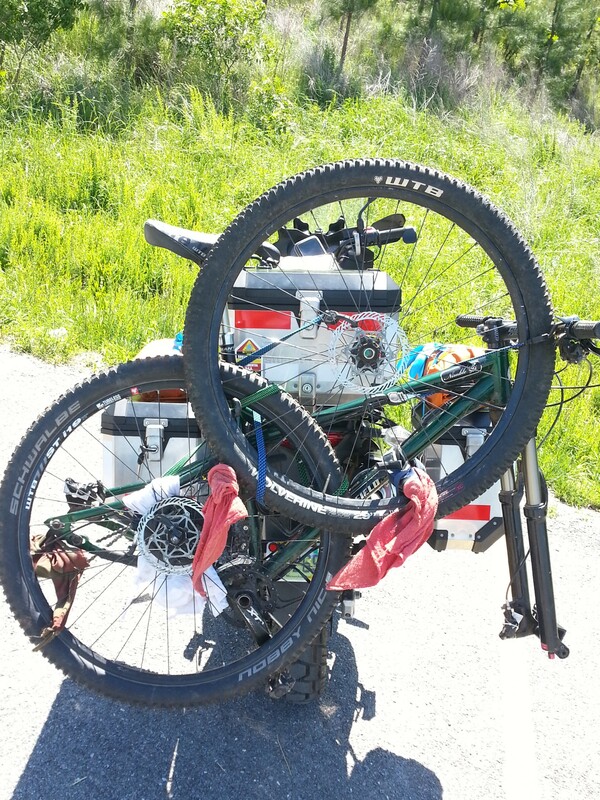 I've also had the luck of friends transporting my mountain bike to different destinations while I rode the moto. 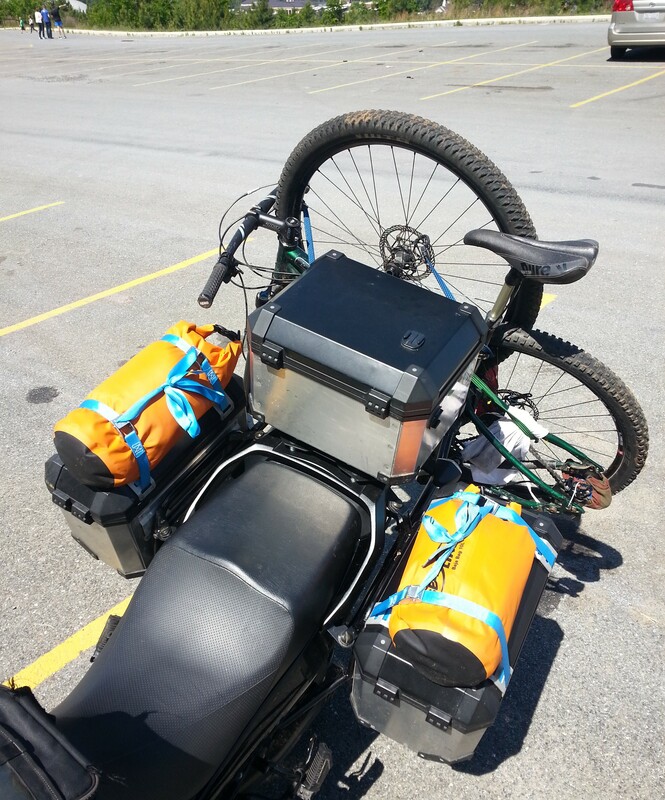 All along, though, I've wanted to develop a way to carry my mountain bike on the motorcycle in order to be 100% self-sufficient in these moto/mountain bike trips. 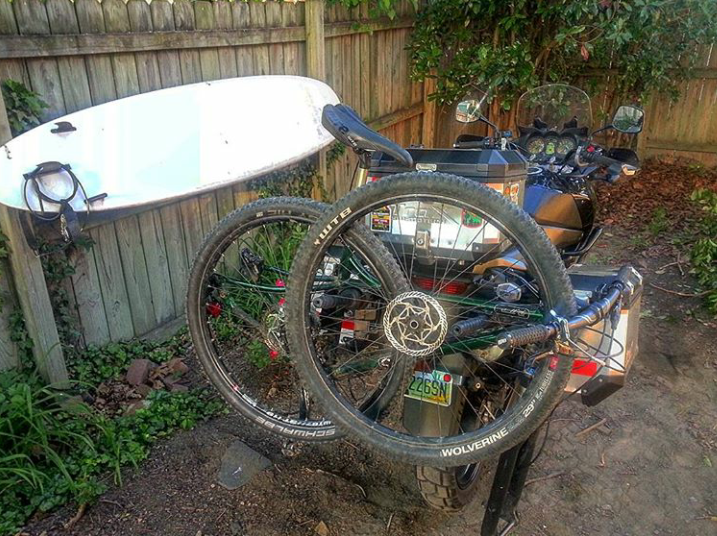 After considering several variations of the standard "bike tray" I eventually settled on a different design - the "trunk rack" adapted to a motorcycle. 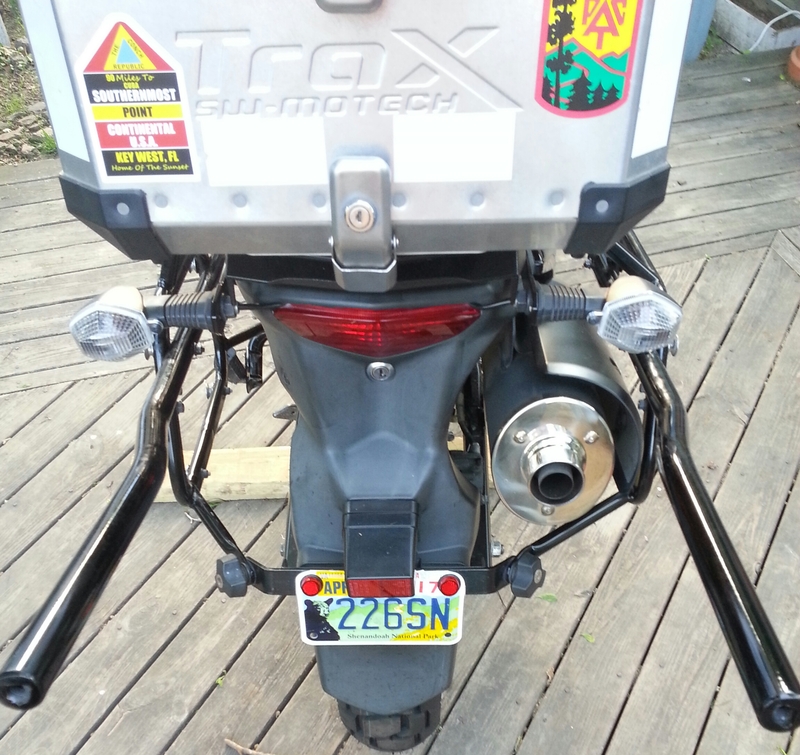 It ended up being extremely simple, especially since I was able to mount bars to the existing frame of my SW Motech luggage system. 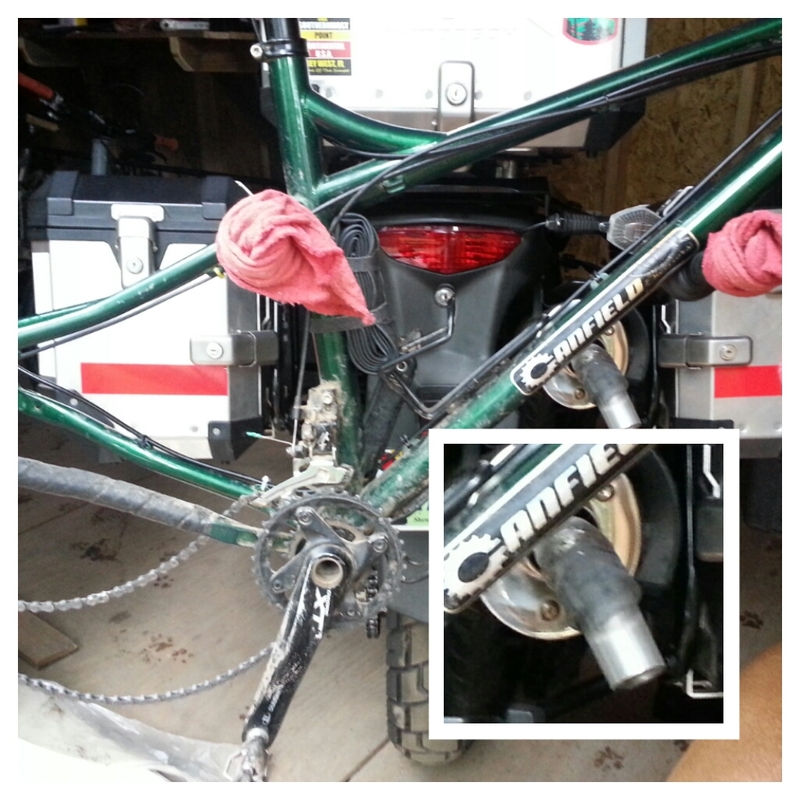 The only real fabrication needed was bending the two tubes to tuck within the profile of the bicycle. Other than that, I welded nuts in the ends of the bars in case I wanted to bolt anything to them. Four holes and longer hardware allowed them to bolt in place. While I was at it, I installed the Enduro Guardian 1" lift dog bones to give the rear of the bike a slightly better stance. I had the rear wheel off anyway, since I needed to balance the new tire. With it out of the way, the dog bone install was a breeze. 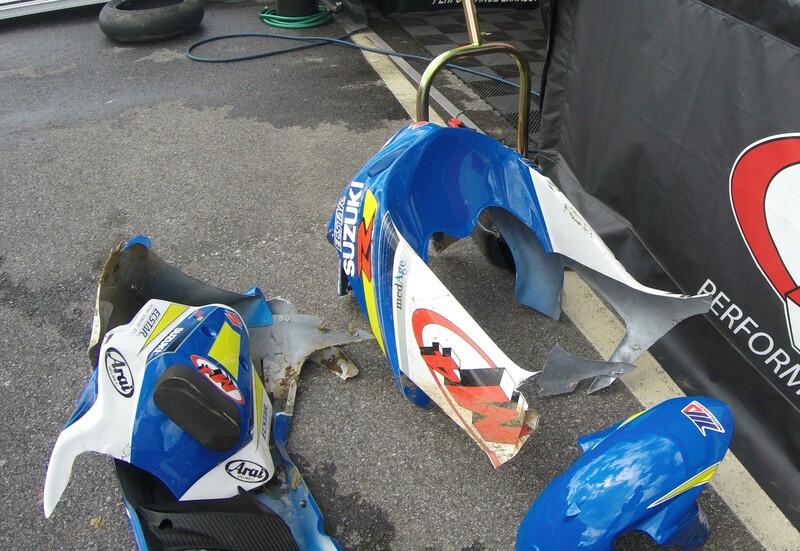 During the week, I tested the arrangement - but found out quickly the consequences of mounting the bike in the path of the exhaust. 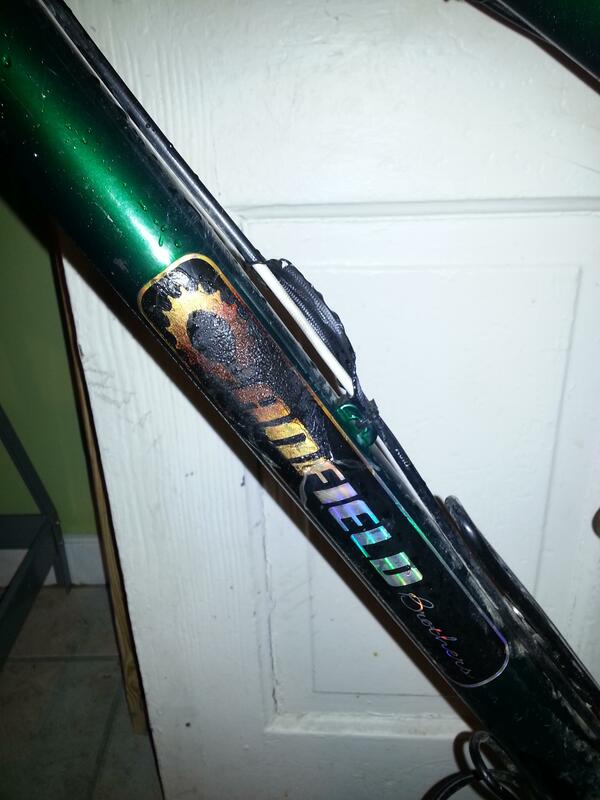 In no time, the exhaust fumes had roasted the hydraulic brake hose and charred the decals on my downtube. Luckily I was able to find another hose and had it bled before the weekend's trip to VIR. This time, I welded together two exhaust adapters which LUCKILY fit snugly around the inner pipe. I heated the adapters with an oxy-acytalene torch and bent them at a 45 degree angle. I also mounted the bike higher on the rack and am glad to say that it was a success!